A literature review found an association between increased falls risk and malnutrition, sarcopenia, vitamin D deficiency and dehydration. Strategies to identify, prevent and treat these conditions can help to reduce falls risk in at-risk groups such as frail, older people. 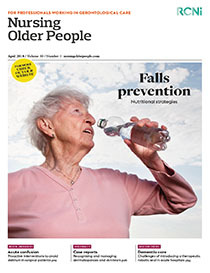 Nurses can reduce falls risk in older people by raising awareness of risk factors and embedding nutritional strategies in local falls reduction strategies.